Address: Rua do Terminal Nº2, Castelo Branco (Región Centro), Portugal. Residencial Terminal provides a daily breakfast and is located in historical Castelo Branco, a 2-minute drive from the centre. The Castelo Branco Train Station is a 6-minute drive from the Residencial. The air-conditioned rooms all come with a TV, desk and a small seating area. 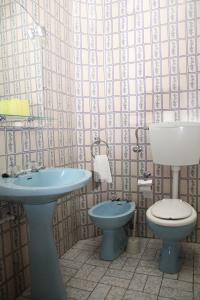 Each has access to a private bathroom with either a bath or shower. Free WiFi is provided. Breakfast is included in the rate and served in the Residencial Terminal’s bright meal area. The Castelo Branco centre has various restaurants, where guests might taste traditional Portuguese flavours. The border into neighbouring Spain is a 30-minute drive away. Idanha-a-Nova is a 39-minute drive and Monsanto is a 53-minute drive from this Bed & Breakfast. Lisbon International Airport is a 110-minute drive from the Residencial Terminal.